Pet Airways is a boon to everyone who wants to transport a furry family member across the country but doesn’t want to drive — or treat their pet as cargo. This innovative airline, which debuted in 2009, is also a godsend for shelters. A plane that holds 50 dogs and cats in the main cabin can get animals to locations where they are more likely to get adopted without subjecting them to the trauma of traveling in the hold. In some respects, Pet Airways is like standard commercial carriers. It has its own passenger lounges, aircraft tailored to its flights, and a select group of hub cities. But when the bulk of those on board are nonhuman, you figure certain adjustments will need to be made. The Beechcraft 1900, a twin turbo-prop often used by commercial airlines for short flights, was chosen for its safety and reliability record. The 19-seater — that’s 19 seats for humans — was converted to accommodate pet carriers. The Beechcraft’s slower air speeds and lower flight altitudes put less stress on the “pawsengers” — as Pet Airways dubs them. Advance interviews with owners create a medical and temperament profile of every pet that flies with Pet Airways. No breeds are discriminated against but the airline needs to know in advance whether a pet has a history of aggression. Would that human passengers were screened so thoroughly — and denied alcohol if their profiles indicated potential problems. Owners check their charges into the pet lounge two hours before the flight. Not only do the Pet Airways representatives look for visible signs of ill health, in addition to checking the required health certificate, but they also make sure that animals are not tranquilized. “Drugs can impair breathing. Pets flying in temperature-controlled, pressurized cabins don’t need to be tranquilized,” says Pet Airways representative Aly Tognotti. The pets, who tend to nod off because of the engines’ hum, are checked on every 15 minutes. If the flight is long, the plane will land and the dogs will get a walk, potty break, and maybe a drink of water. Because owners can’t fly on Pet Airways, they have to book separate travel to their desired destinations. They needn’t worry if a flight is delayed, however. Pets are always cared for by airline staff until they are reunited with their people. With pet travel taking off, a dedicated airline for animals is clearly an idea whose time has come. Currently, Pet Airways goes to New York City, Washington D.C./Baltimore, Chicago, Omaha, Denver, Phoenix, Los Angeles, Ft. Lauderdale and Atlanta. Houston, Austin, Dallas, and St. Louis will soon join the Pet Airways roster. Tognotti says that the representatives are constantly fielding calls from people who want to know when Pet Airways is coming to their city. According to Tognotti, the goal is to service the country’s 25 top cities as soon as possible. To learn more about Pet Airways, including some of its more unusual passengers (hint: one is a “clawsenger,”), listen to the interview with Tognotti, who has been with the company from its start. This entry was posted in Edie Jarolim, Pet Travel and tagged Aly Tognotti, Pawsengers, Pet Airways, pet travel on June 12, 2011 by Edie Jarolim. I don't know how you could support or condone Pet Airways, considering how the cheat consumers. Tim and I arranged a trip to LA to pick up our puppy and spend the holidays with our family. We booked a return flight to New York for our puppy based on Pet Airways’ availability, and coordinated our travel itinerary to match his. 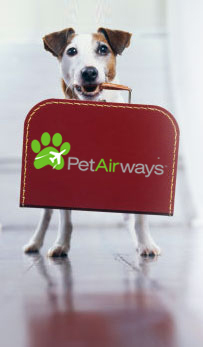 On December 28th we were notified that all Pet Airways flights for the following week were canceled. There was no explanation provided – just the offer to reschedule the flight, with the suggestion not to bother trying to call and speak to Customer Service due to long wait times. My husband and I suddenly had to scramble to find flights home for us and our puppy during one of the busiest travel weeks of the year. When booking with Pet Airways, we believed that by utilizing a high end service we would be avoiding unnecessary stress for both us and our new puppy; we were clearly wrong. We were forced to pay fees for our own flight change, discard the crate that we had already purchased for travel with Pet Airways and purchase a new crate that was approved by the airline that was now providing the only option we had left to get the puppy home – in cargo. You state on your website that “Of course, there’s one thing (a dog) is certainly not, and that’s cargo.” You can only imagine how upset we were when we realized we simply had no other option if we wanted to get home.Once we made it home to New York, I genuinely believed that Pet Airways would take note of the incredible inconvenience they had caused and make good on the $253 in unnecessary expenses we encountered. When considering the amount of stress that the situation created for both us and our puppy, as well as the time that it took to make our way back home with him, this reimbursement does not seem like much to ask.As directed by the cancellation email from your company, I attempted to reach Chris Wheeler via email. When I didn’t receive a response, I attempted to contact her by phone. I called several times a day for a full week – the phone line went to voicemail every single time. I resorted to trying to reach other extensions, even trying the option to make a new reservation just to make my way to a human being that might be able to help. Every single phone call brought me to a voicemail message. When booking our puppy’s flight, we had thought we were paying a premium for top notch service offered by a reputable company…only to learn that we were actually dealing with a company that doesn’t even have employees to answer their phones.Over the past couple of weeks we spent some time looking in to what other customers had to say about doing business with Pet Airways, and learned that our experience is not rare – flights are frequently canceled at the last minute, no apologies offered, no customer service agent to take phone calls, and delays in refunds for services that were never rendered. Somehow, these comments are left off of the “What People Are Saying” section of your website. I am shocked that a company would exploit people’s love of their pets. Anyone visiting this page should beware and make sure to look up Pet Airways on the Better Business Bureau and Yelp pages, which can not be censored by the company for PR purposes. I love Pet Airways and hope they have a long, happy future in front of them.